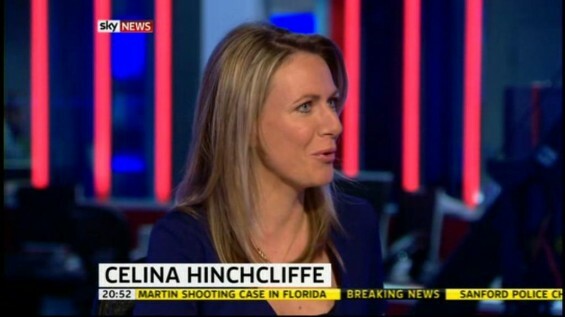 The credentials of Sky News’ Celina Hinchcliffe are without question as she continues to enjoy a status as one of the most esteemed female figures in British broadcasting, and Match of the Day’s very first female presenter has a foot firmly in each camp when it comes to this site’s two main subject areas. Music and football are among the prominent fields of interest for Celina and as someone who has covered the best of the best with regard to sporting events, including the World Cup and the Olympics to name but two, the Sheffield Wednesday supporter certainly has a story to tell. Celina has dabbled in stand-up comedy in the past, as well as being extremely well-versed in acting as a graduate of LAMDA, and she has a strong feeling for another universally-popular art form in the shape of music. The US singer Marlena Shaw, known for her version of the song ‘California Soul’ amongst her work, was cited by Celina in amongst her favourites related to this genre but there are certainly numerous others to have influenced her listening pleasures. “I do love Motown, I know it’s massively old school, groups like The Four Tops. I obviously like Coldplay, as well as alternative rock like Jimmy Eat World and cheesier ones like Matchbox Twenty. “Growing up I had a lot of influence from my cousins who were really into The Police, Heaven 17 and Human League. My cousin Jonty Whitehead worked on Sky Sports and he’s now at FOX Soccer in America, he got me into a lot of music. “I’m still obsessed with The Police and I went to their reunion tour, there’s also Bryan Ferry and Roxy Music. My Dad was into Eric Clapton and my Mum would always play Elton John. Family was one of the overriding factors to come to the fore when she discussed her music taste and that was also such a strong theme when it came to choosing her football team. As I have made reference to in a number of my past interviews on here I am a Sheffield Wednesday supporter myself and Celina takes up the story of how she got the irrepressible blue and white bug despite coming from Berkshire. “My uncle Geoffrey Whitehead is an actor (Z Cars, Not Going Out, Midsomer Murders, Little Britain) so he’s a bit of a famous Owl, he got me and my cousins into them when I was young. He bought me my first kit in 1980 and I’ve still got it, I was always kicking a football against the wall outside and Wednesday were my first love. I mentioned to Celina how I recall reading a profile of her a few years ago in which she mentioned that her school friends had New Kids on the Block on their diaries while she had Chris Waddle. That prompted her to recall the time she met the ex-Owls idol and England midfield maestro, and on this occasion it appears an old adage could not be considered true. 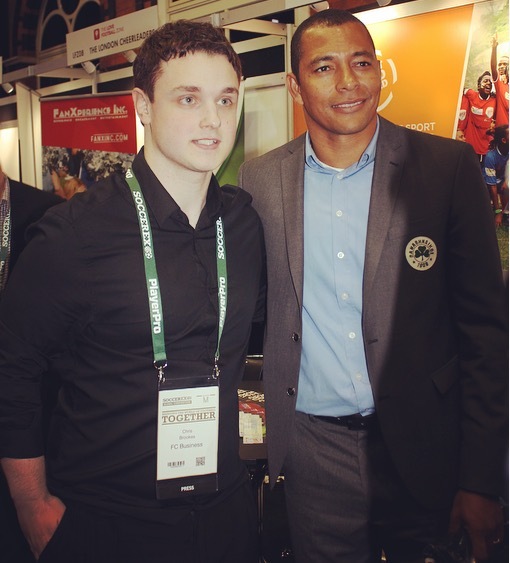 “I got the chance to meet Waddle when I was doing the BBC highlights for the World Cup with Adrian Chiles in 2006. We went out for beers and they say you should never meet your heroes but he didn’t disappoint. Waddle played a principle role in securing Wednesday’s place in the 1993 FA Cup final as his superb free-kick gave Trevor Francis’ side the lead over bitter rivals Sheffield United in the semi-final at Wembley. With over 75,000 in attendance under the famous twin towers the Blades would equalise through Alan Cork before Mark Bright grabbed the winner for Wednesday in extra-time. In the final, The Owls drew with Arsenal on the 15th of May 1993 to force a replay five days later. Ian Wright’s opener for George Graham’s Gunners was cancelled out by Waddle’s deflected effort before Andy Linighan sealed the game for Arsenal at the end of extra-time. Wednesday had also been beaten in the League Cup final by the same opponents that year and it was too much to bear for a 17-year-old Celina! Celina has presented Football Focus and Final Score in the past as well as making history in 2005 when she stood in for Gary Lineker as the host of Match of the Day, becoming the first female to present English football’s most renowned programme ever. There is a footballing link back to music as Celina names the acts she has met in her career, with the first band she mentions one who are split by their Sheffield Wednesday and Sheffield United allegiances. “Def Leppard – they were pretty cool. (After lead singer Joe Elliot was mentioned for being a United fan) Yeah I didn’t shake his hand! The family background of Celina is a constant with regard to the origins of much of her musical taste past and present and it is also closely connected with the first record she ever had, as well as having a link to music she has seen live. When Celina brought up the first song that she mentions though all I could think of was Alan Partridge as he labelled it a ‘gibberish classic’! “The first record I had I think was The Police ‘De Do Do Do, De Da Da Da’, I was four so my Dad bought it me. The second one that I had was Boomtown Rats ‘Lookin’ After No. 1’. “The first I bought with my own money was ‘Do They Know It’s Christmas?’ (Band Aid). I’ve been at lock-ins in Irish pubs where there have been sing-a-longs, there was one in County Kerry that was pretty amazing, and especially with my Mum’s origin being Irish. 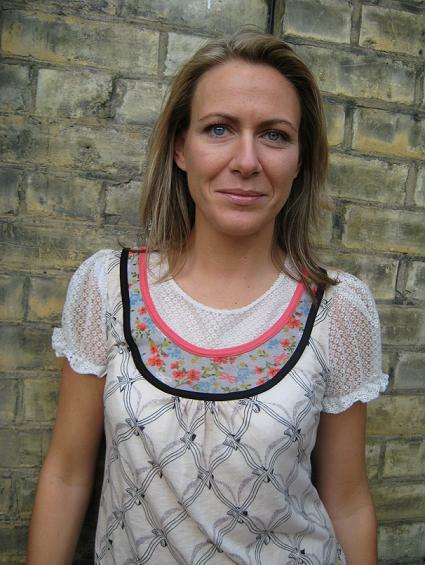 Fellow female broadcaster Gabby Logan’s BBC documentary ‘Sexism In Football?’ earlier in the year explored the issue in the title and featured the likes of Jacqui Oatley (Match of the Day’s first female commentator) discussing their experiences of certain attitudes during their career in sport. Celina’s background in football is clear to see with the aforementioned work she has done on the likes of the World Cup and Match of the Day, as well as her reporting on African football, corporate hosting for the FA and UEFA and BBC Southern Counties reports in her early career. These are just a select few examples of the work she has done in football and when you also considered the way she described her childhood love for the game earlier in the interview it is obvious that she could be no better suited to her work in this area. We talked about the attitudes and prejudices she has come across in her career as a woman in a notoriously male-dominated sport. “I found that those at the BBC were really wonderful and with so many successful female broadcasters I was really encouraged. I have noticed it from the odd manager (in football) but you can either dwell on it or get on with it. “There are also managers like (Graeme) Souness and (Arsene) Wenger who have shown a huge amount of respect. I’ve found that as long as you really know your stuff you’ll be alright. Among her career’s work Celina has hosted the coverage of FA Women’s Cup finals and I brought up something I discussed in my recent interview with American player Tiffany Weimer. My point centred on the progress I felt was made with regard to the perception of the women’s game in this country during the Olympics but how it was still clear that many will choose to go out of their way to dismiss the efforts. My question was how far can women’s football go with such scepticism to contend with? “It does have a lot of prejudice in this country in particular. I think it’s a lot easier in the Scandinavian countries for example where there’s less of a male bastion but it’s still the number one participation female sport in the UK. “I’ve got confidence in it but I think we do need a professional league and professional standards to be taken seriously. I don’t know how committed the FA are but it’s a great talking point. “It’s got to be really backed, the players really are good enough. Kelly Smith and others here are world-class but the key thing is that you can’t compare men and women’s football because of the difference in how physical and quick it is. An English Literature and Drama graduate from Birmingham University, Celina was regularly a key part of the BBC’s coverage of Wimbledon and when she was asked about the most surreal interview she has ever done it was one of the true all-time tennis greats that came to mind. This year saw the end to Celina’s time with the BBC after an unforgettable decade but her prestigious gigs have not slowed up in the months since as she has been kept busy by work and another pretty important commitment! “I’ve got a great team to work for at Sky News and I’ll be presenting the sport regularly during the day from the New Year onwards. I did the French Open coverage for ITV and will be for this coming year which might lead to more opportunities. As we touched upon it earlier and as it is something that myself and Celina share with tens of thousands of others there is no better way to draw things to a close than to focus on Sheffield Wednesday. Reverend and the Makers singer Jon McClure described on here in his interview what he thinks makes the club special and I have had a go at putting it into words myself in the past. Celina outlined her own feelings on this and her answer certainly passes the test for me. “The fans, the support, the singing – Hillsborough is the spiritual home of football for me. The fans stick with the club through thick and thin, they’re not gloryhunters, it’s been a rollercoaster ride but I think we’re quite humble. “We’ve generally tried to play football and stick to principles over the years. When people ask me who I support and I say I’m a Sheffield Wednesday fan there seems to be a quiet respect there. “I’ve been up (to Hillsborough) a few times although not yet since I’ve had Harry. I was there for the play-off final against Hartlepool in 2005 and it was one of the best days of my life. For the very last question I usually ask players to select the 5-a-side team of the best they have ever played alongside and in the case of Sky Sports News presenter Olivia Godfrey it was her all-time Chelsea line-up for example. With Celina I was looking for the 5-a-side of the best Wednesday players from her lifetime and although supporters may raise eyebrows at her keeper selection, due mainly to his crucial error in the 1993 FA Cup final, there will be little doubt about the others (unless Roland Nilsson’s omission is mentioned!). “Chris Woods in goal – safe hands. Des Walker at the back – solid, one of the greatest defenders, complete confidence in him. “John Sheridan – a dead-ball specialist and a great midfielder. 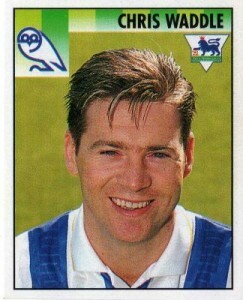 Chris Waddle – one of the best to put on the blue and white stripes, mercurial, incredible.